What exactly is a soft-shell crab? Crabs belong to a group of animals called arthropods whose skeletal support is provided by a "shell" outside their bodies. Growth is problematic because the old shell must be shed and a larger one formed in its place. This process, called molting, occurs many times through the crab's lifetime, but at a decelerating rate. 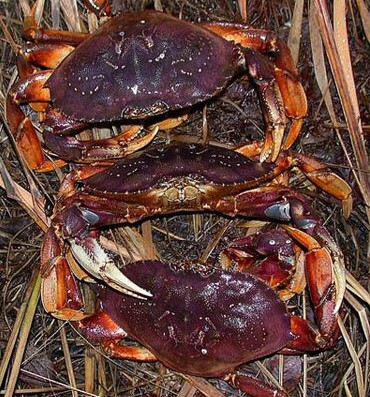 Dungeness crabs molt about 12 times by age two, and then approximately once a year through age six. Molting is one of nature's most interesting and curious phenomena. Data within Puget Sound suggests that while a given area may have one or two "peaks" of molting crab during the year, not all individual crabs adhere strictly to this pattern. Just before molting, the crab has formed the basic "template" of a new shell underneath its older shell. At this time, calcium is absorbed from the old shell and it becomes somewhat flexible. 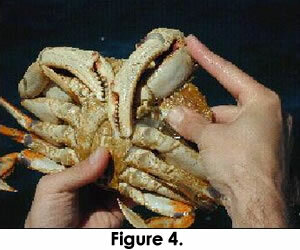 The old shell splits at the back of the crab and it backs out of it's old skeleton (Figure 1). Even the eye stalk and gill coverings remain with the old shell. This early stage soft-shell crab is extremely vulnerable to damage and predation, and for the next few days will remain hidden or buried in sediment as the new shell expands and starts to harden. Biologists have noted that it is uncommon to capture these early stage crabs in baited traps. Within a few days, however, the midstage crab will become an active, voracious feeder. For the next 2 to 3 months, it's shell will continue to harden while muscle tissue builds within the expanded body. During this time, the soft-shell crab is likely to be captured in traps and is quite vulnerable to shell damage. Why is there a requirement to release these crabs? A soft-shell crab will yield less than 20% of it's weight in meat while a prime hard-shell crab will yield 25% of its weight in meat. Harvesting crab when they are hard-shell maximizes the yield for a given number of crab. More significant, however, is that the meat from a soft-shell crab is of very low quality compared to meat from a harder cousin. People have described this meat as watery, mushy, lacking in texture, or even "jelly-like" and as a result it is often thrown away. Carefully releasing these crab eliminates this wastage and allows the crab to be harvested later, when meat quality and quantity is greatest. How do you determine if a crab is soft-shell? The definitive test for identifying a soft-shell crab is the pinch test. 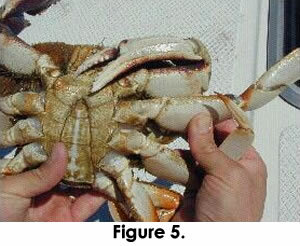 When done correctly, the pinch is delivered by the recreational crabber to the crab and not the other way around. 2. 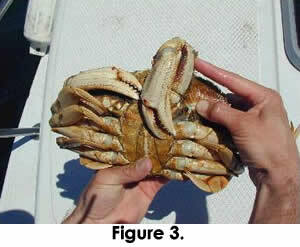 Carefully push the "elbow" of one claw towards the mouth of the crab, exposing the shell that is usually covered by the folded claw (Figure 3). 3. Pinch the shell with your thumb at the point shown,gradually increasing the pressure (Figure 4). Remember, you do not want to break the shell while performing the test (crabs have blood and can bleed to death). 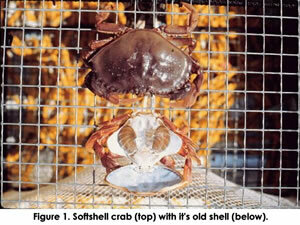 If the shell flexes or bends, release the pressure and return the crab carefully to the water. Take care not to drop any crab which you release onto hard surfaces and do not fling them roughly into the water. If the shell has not flexed and you have reached the point at which you would have easily crushed a tough peanut, then you have a hard (and legal) crab to keep for the table. Note: Experienced crabbers note that there are other indicators that crabs may be soft-shell. While these indicators are not the definitive test used in Washington, they do help people quickly identify crab which are likely to be soft-shell. Some pinch the center of the large section of the first walking leg in a test similar to the one above (Figure 5). In most cases, the two pinch tests yield identical results ... however some crab will pass the former test while failing the leg test. 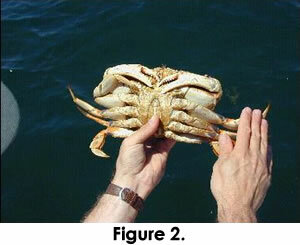 After lifting many legal size crab, people note that the crab which seem light for their size are generally soft-shell. 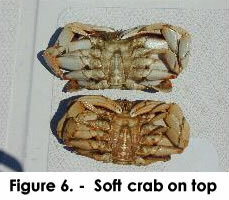 The shells of these crabs also tend to be white on the underside, while those of hard-shell crabs are a darker yellowish brown (Figure 6) and often covered with barnacles and algae. Do yourself and the crab resource a favor ....... Release soft-shell crab and show others how to do it!